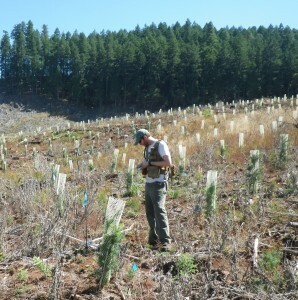 Brad Withrow-Robinson, OSU Forestry & Natural Resources Extension agent, Benton, Linn and Polk Counties. 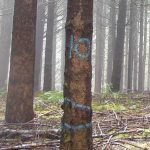 We have been dedicating a fair amount of screen space and class time lately to the idea that many family forest landowners would benefit from thinning their young stands. We explored the reasons to consider young stand thinning (YST) as well as some approaches in a series of posts on YST . YST is consistent with the situation and goals of many family forest landowners, which often include growing older and more diverse forests. That said, like many other well-grounded activities, YST is not without some potential drawbacks. In this series about young stand thinning , I’ve worked on the assumption that people know the density of trees in their woods. I realize that in many cases, people don’t really know that, so cannot easily apply that information to deciding if they have enough room for healthy growth or if trees need to be thinned. 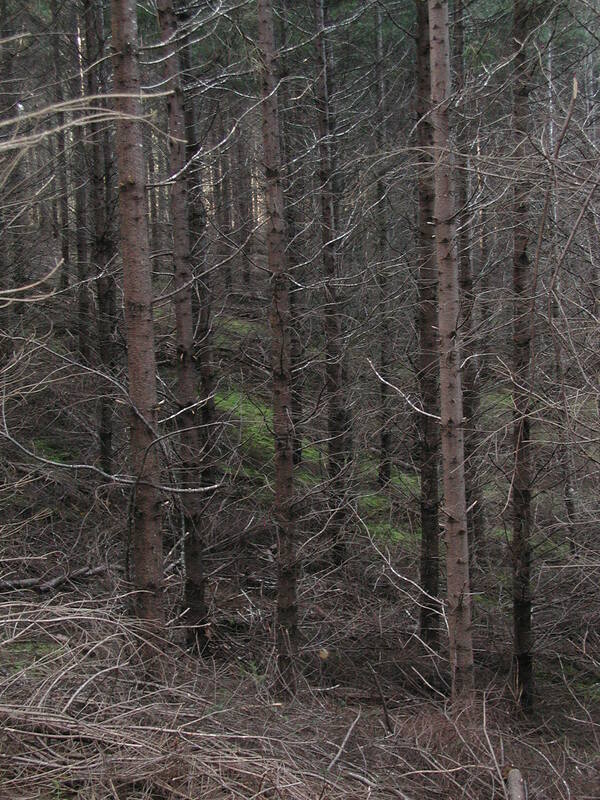 The idea of young stand thinning (YST) is to avoid harmful overcrowding later by removing excess trees early on. The impact of thinning out a tree is very local. 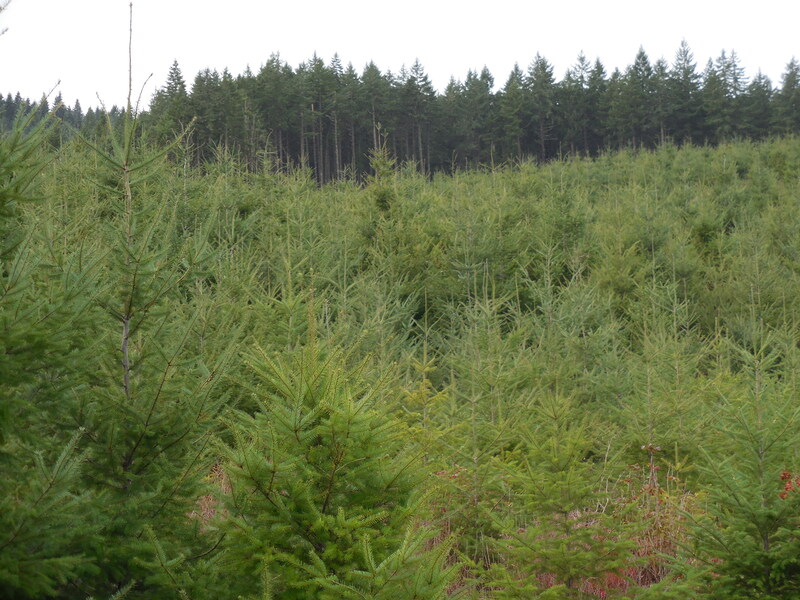 The overall stocking level (trees per acre) can be misleading. It is the spacing among immediate neighbors that counts. The greatest benefit of YST is increased growing space rather than selection among trees. Creating more growing space to benefit as many leave trees as possible is the primary goal. Culling is secondary. YST is key to achieving longer rotations and many non-timber objectives many family forest landowners desire. Many aesthetic and habitat objectives of family forest landowners come with older, less dense stands like this stand of about 70 years. It is important to get on this path early. In previous segments I argued that many people have too many trees in their young stands which may be costly and harmful to the long term growth of the stand. Most importantly, having too many trees at this stage can undermine common landowner objectives of growing attractive, longer rotation diverse forest habitats and can force landowners into shorter rotations than imagined. 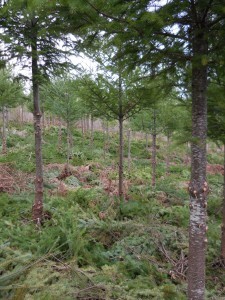 While this suggests that people should think about planting fewer trees per acre in the future (a step deserving some careful consideration), it highlights the need for thinning in many existing young stands to correct overstocking at an early age. This may include your stand. 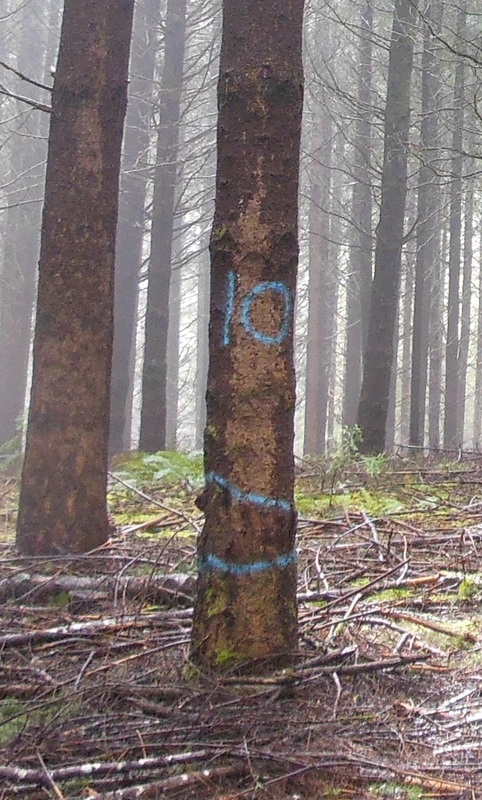 Posted in forest management, Uncategorized. 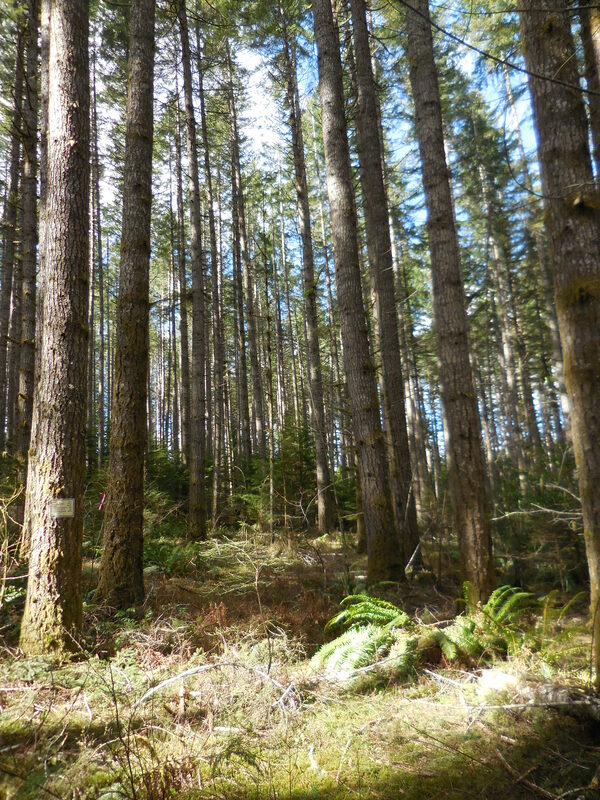 In a previous article , I wrote that many folks in NW Oregon are growing too many trees in young stands given some common family forest landowners’ objectives, including doing a selective thinning harvest when the trees are in their mid-20s. While on their way towards a variety of longer-term objectives and stand conditions, most people are hoping that their initial harvest will at least break even (when it is sometimes called a commercial thinning). So we need to focus on reaching that first thinning harvest in a timely manner and leaving the stand in a good condition to meet future objectives. Let’s begin by looking at what it takes to have a successful thinning harvest. 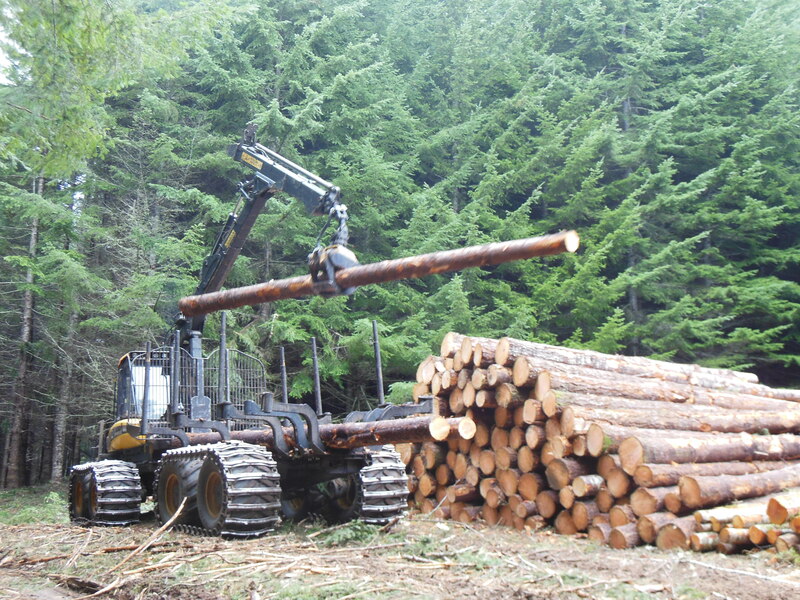 My contacts in the business around the mid-Valley tell me that while the first thinning harvest should provide a mix of saw logs and chip logs, most of the surplus trees removed in the thinning need to produce a sawlog or two if you hope to break even or make a little money (a mix of around 2/3 saw logs and the remaining 1/3 chip logs is a rule of thumb used by some). Too many small logs and the operation is costing money. That sawlog will vary according to the mill it is headed to, but is generally 20 feet to 32 feet long with a 6 or 7 inch top. Smaller wood goes to chip and saw or pulp. Posted in Forest Health, forest management. 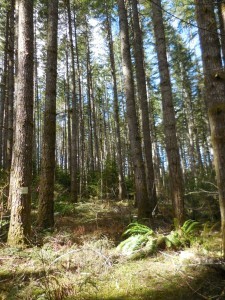 In my travels around the mid-Willamette Valley, I am seeing a lot of young conifer stands (generally Douglas-fir up to 20-something years old) with just too many trees. Why do I say there are too many trees? I know many people in this part of western Oregon who are patiently waiting for their trees to grow, hoping to thin the trees in a selective harvest when the stand is about 25 years old. They plan to sell the harvested trees to cover costs and would like to break-even or make a bit back on establishment expenses. All too often it is not working out that way. Instead, as the stand approaches the target age they find that trees have already become too crowded, with too many small, slow growing trees in the stand. 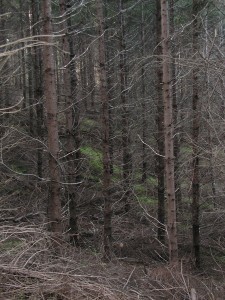 The trees are still too small to support a profitable harvest thinning operation (also called a commercial thinning). To thin at that point is to do so at a cost, although it may be best for the woodland in the long-run. To delay the thinning and wait for the trees to grow enough to make the thinning harvest profitable is appealing, but deceptive. It may avoid the short term expense, but is likely to weaken the stand at a long-term cost of growth, stand stability and future options. It is a classic “pay now or pay later” situation. Last month I spent a morning at OSU attending the annual science meeting of the Vegetation Management Research Cooperative (VMRC). It was well worth the time. 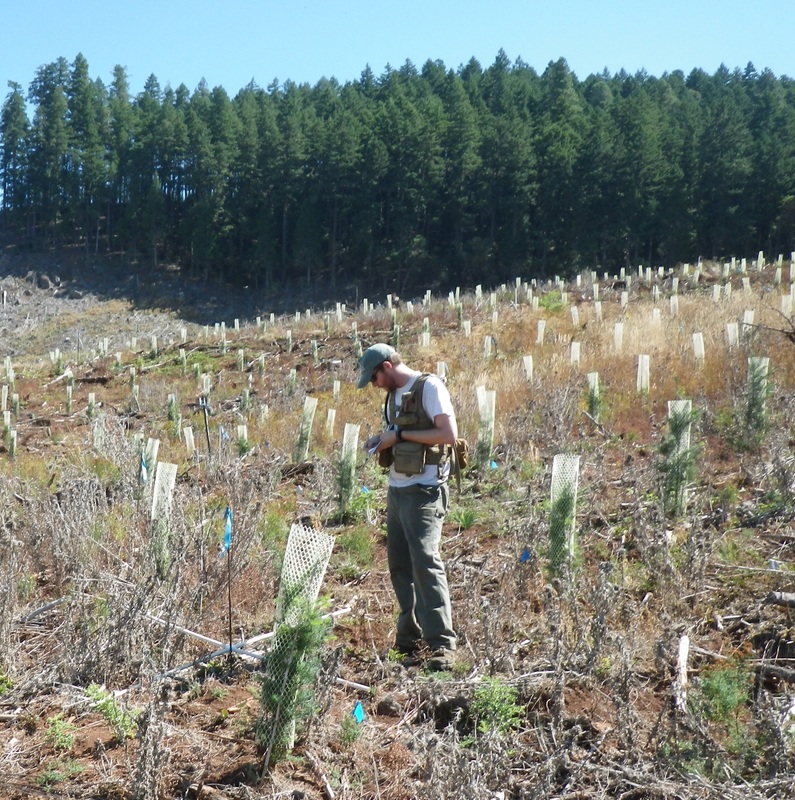 The VMRC’s mission includes conducting applied reforestation research of young plantations from seedling establishment through crown closure and, to promote reforestation success. 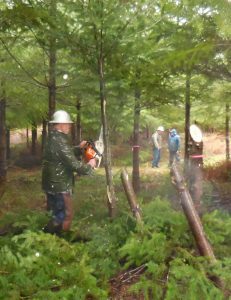 The VMRC’s research has an emphasis on practical, operational vegetation control, and their research is broadly relevant and readily applied to the needs of family forest landowners, so I do try to keep up on their work. For those so inclined, pruning season is now open. There are many reasons people pick up a saw or loppers to prune up their trees in young stands. The most common motivations I hear are accessibility, aesthetics and fire resistance/prevention. Even pruning up just a single- eight foot “lift” can serve any or all of those objectives. People want to be able to walk freely around the place without fighting through dense brush the whole way. So many prune to open trails or corridors. This allows them to get to favorite spots more easily, or just get around and see how things are doing. It lets them enjoy the property more (daily walks or bird watching) and also to more easily take care of tasks like spot spraying invasive weeds. Pruning a whole block of trees improves not just access but opens up the line of sight. It quickly changes the look and feel of a young stand and gives the stand an open aesthetic that many people like. 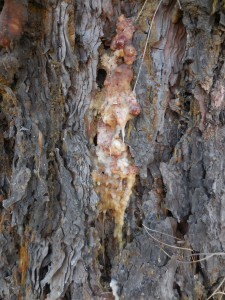 I recently got a call from a fellow whose Douglas-fir trees were covered with globs of pinkish pitch. 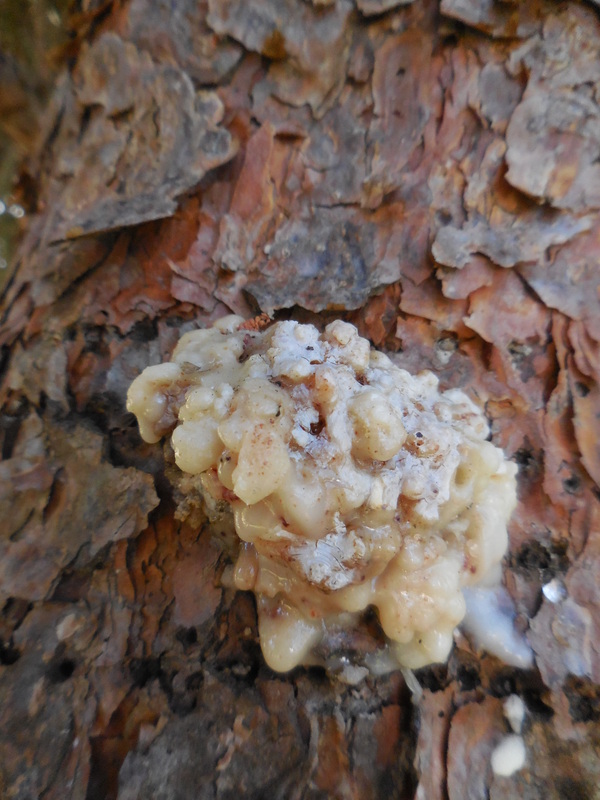 It looked kind of like candle wax drippings on a Chianti bottle in some Italian restaurant, except it was on the trunks of his trees. As we talked I discovered that it was not an old stand, and the landowner had been out during the nice weather last summer and pruned his trees up six or eight feet to make it easier to get around and to reduce the risk of fire down near the County road. The pitch blobs were at the pruning scars. The culprit here is the Sequoia pitch moth (Synanthedon sequoia), a common clear-winged moth that attacks many conifer species. 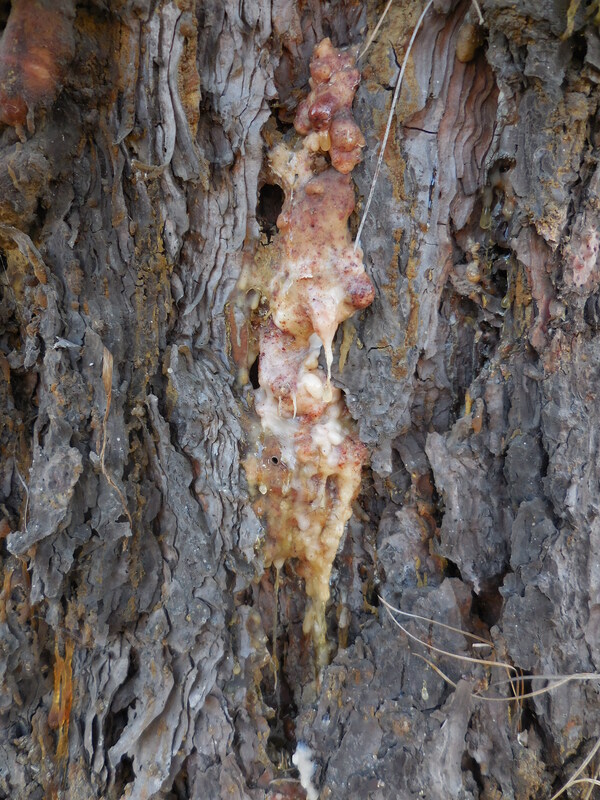 Although commonly seen in town in people’s shore pine and other ornamental pine species, it is not generally a problem on Douglas-fir, or native Valley ponderosa pine except when the tree is wounded. A common and very attractive wound is easily created by pruning live branches during the summer months (April thru September) when the bark is soft and the adult moth is active. Although unlikely to kill your trees it is unsightly and generally avoidable. So this summer, put down those pruning shears. Save that job for the winter months.